Spring migration in the northern hemisphere is an attenuated event, beginning with a trickle that increases to a torrent of songbirds. You may, depending on where you are, be in it up to your neck or just your ankles. Regardless, birds are on the move throughout the world’s temperate regions RIGHT NOW. So where will you be this weekend and will you be birding? Share your plans in the comments below. I’ll attempt Saw-whet Owls yet again at Owl Woods, this time with absolutely no expectations of actually seeing one. Corey will, as usual, likely be in Forest Park and/or Flushing Meadows Park, and just in Queens generally. Charlie will, as usual, be roaming the grounds of Great Chalfield. the answer to that question depends on whether this volcanic dust cloud disappears in time for me to fly to my best man’s stag night or not. Stupid volcano. Either way I’m sure I’ll see something interesting. 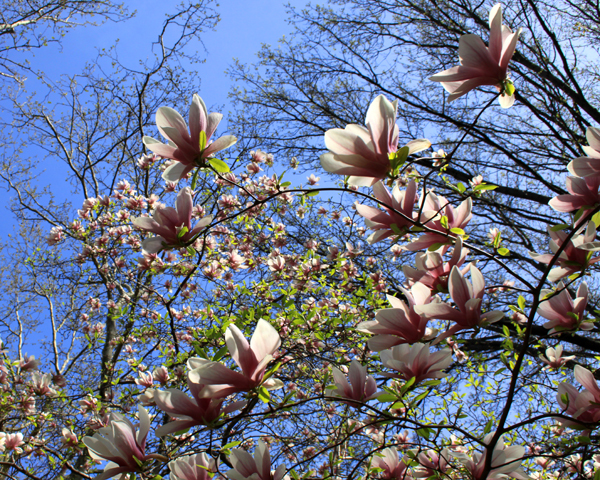 wonderful, wonderful shot of magnolias!!! Gorgeous capture! Love the beautiful colors against the sky. The magnolias are magnificent! Have a great weekend, Mike! I am going to visit a reforestation project in the highlands near Volcan Poas in Costa Rica. I won’t be surprised if it rains the whole time but it will be interesting to see if there any migrants present. Haven’t done birding but do love birds. The magnolias are in bloom it looks so pretty. Happy weekend! Wow, that’s a beautiful pic. Work meeting in State College, PA on Saturday. Who knows what I may see there? Is the exact center of Pennsylvania a migrant trap? Nice picture Mike. Did you buy a new camera or was this taken with that Ipod like thing you carry on your pocket? I’ll be – as usual – hitting the fields south of Leimen, hoping for raptors. The Greater Spotted Eagle Tönn (the one I mentioned last weekend) has already migrated past me, very well to the North, and is currently on his way to Berlin. I’ll be seeing him in September. Raptor migration has been very slow recently with unfavourable winds. I am basically hoping for any migrant raptor whatsoever, but after last year’s success rate, expectations are rather high. My wish-for / dream bird for the coming weekend is a Short-toad Eagle. It’s like wishing / hoping for a Black-throated Gray Warbler in Central Park, but birders need to keep things in perspective and go for the best. Migration is starting to pick up this week here in NC. I’ll be out as much as possible, with and without baby birder. I will be in Zion National Park this weekend, hoping to pick up a few new Southwest birds. Renato, you’re funny. This isn’t a Droid photo. Corey took it with a high-quality camera and lens! Backyard, if it doesn’t rain all weekend. It’s only 10am here, and I’ve already seen a sandhill crane, male and female yellow shafted flickers, robins, house sparrows, mourning doves. a mallard (male), and lots of chasing, aerial fights, and territorial behavior from the red-winged blackbirds. Today, I went to Kountze Lake in Lakewood, CO in the morning and to Loveland in the afternoon. Avocets, Belted Kingfisher, Snowy Egret, Solitary Sandpiper, Kildeer, Wood Ducks, Eastern Phoebe, Turkey Vultures, Kestrel, Great Blue Heron, many Red-tailed Hawks, Robins and Flickers. Sunday, I’m driving to Cheyenne Bottoms and Quivera Nat’l Wildlife Refuge in Kansas. Jamaica Bay, here I come! Hope to drop by Forest Park on the way home — yea Q53 Express bus! Expecting rain all weekend – bu, if not – heading to Lake Katchawanooka north of Peterborough in Ontario. Great pic!